A retired Methodist minister is to conduct communion services by way of Twitter: he will tweet the prayers, and the 'congregation' will tweet back Amen. If they have bread and wine (or grape juice, presumably, or Ribena for those who pride themselves on following the Bible literally), they can set them in front of their computer to be 'consecrated' by tweet. Read about it here, and you can sign up if you like. We all know about the holy man of Padua, don't we? The trouble is knowing which one; there isn't only one major saint in Padua, but at least four, possibly five, plus some minor contenders. I think some of you will be as surprised at what follows as I was when I stumbled across these great bones. 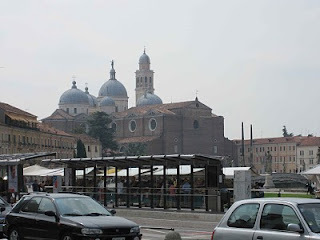 This is not the great basilica in Padua, but the Benedictine church of St Giustina, just off the Prato, as you can see. 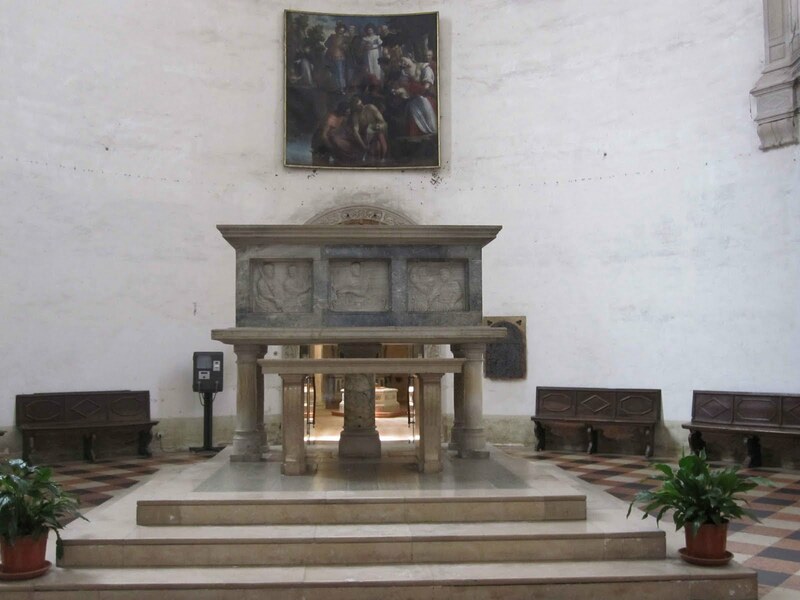 St Giustina is buried here under the high altar, a fine woman and martyr, but she isn't one of the big names. Her church is a pleasing, if severe, neo-classical building inside. The interest lies in the two transepts to right and left ahead. 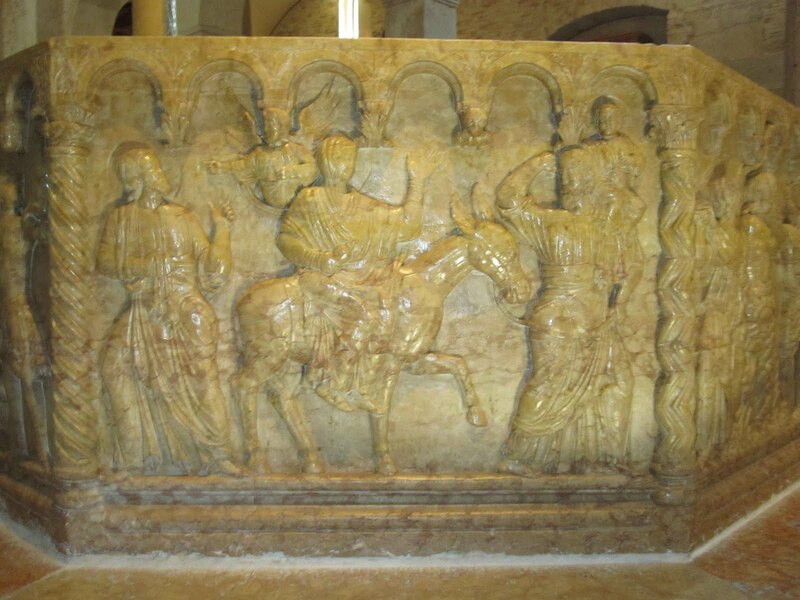 Below you will see the tomb of nobody less than St Luke! 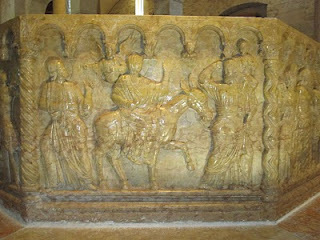 tomb of St Matthias (I expect they drew lots). In the basilica of St Anthony, opposite the great man's tomb, another magnificent shrine, but completely unlabelled. There is a statue of a saint with a pilgrim's staff, resembling St James (but without cockle shell) that might be a clue, but otherwise, I'm stumped. 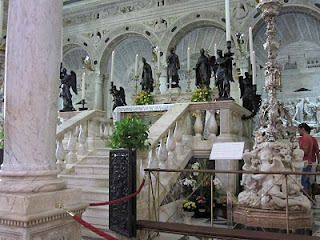 And here is the rather over-the-top tomb of the man everyone knows is in Padua, St Anthony, for whom I was named (my middle name, I mean). But be honest, did you know all these other folk were in Padua? St Anthony is a great saint, no doubt, but I am not quite comfortable that he appears to overshadow an Apostle and an Evangelist! 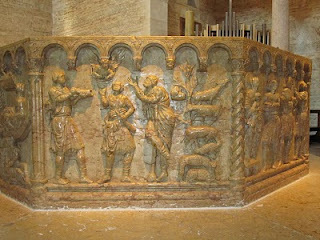 The baptistery in Verona alone is worth a visit. 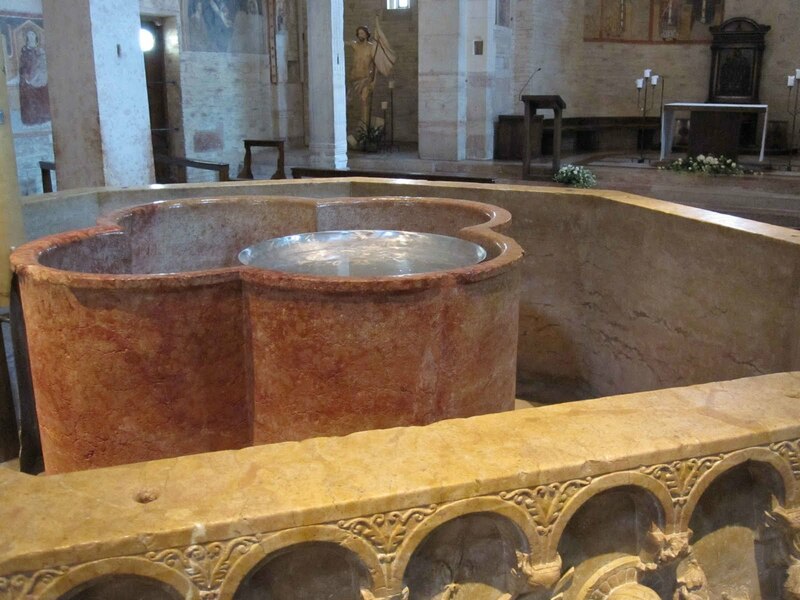 Mind you, I don't imagine that it is used as shown; the priest would need to nimbly leap over the outer barrier in order to baptize a child in that inner tin bowl. The outer barrier is the most interesting thing. It shows scenes from the infancy narratives of our Lord's life. 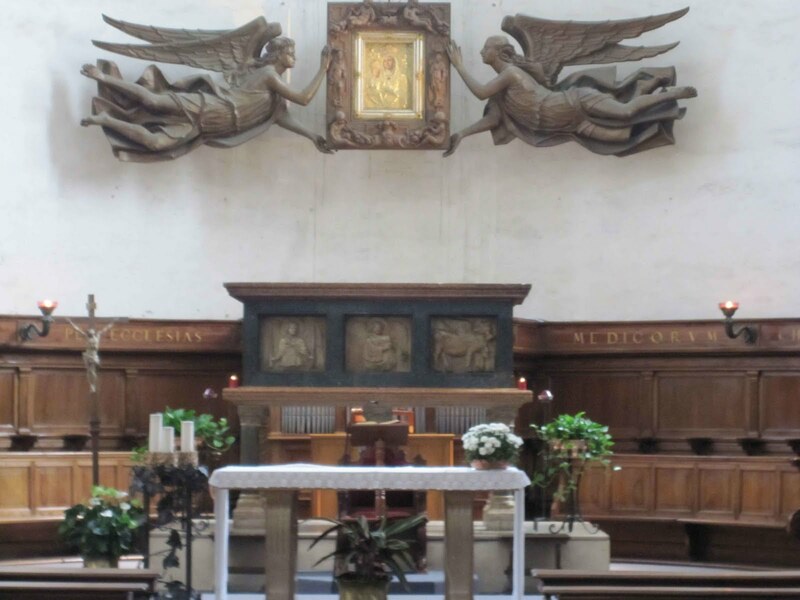 Above we can see the annunciation. This is the only picture I didn't take; this came from the web. My companion alerted me afterwards to what I had missed. That figure on the right would appear to be making 'the horns', the ancient sign mocking a cuckold. I had heard (to my distaste) that to some in the middle ages, St Joseph was a fun figure, cuckolded (as it were) by the Holy Spirit. Is that what this image shows? 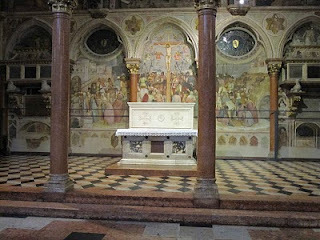 An anonymous commentator on the last post made some remarks about the new sanctuary at Verona, situated in front of the screen; I share his opinions. Not my taste, but could be a lot worse. There are a series of chairs executed in pink Verona marble in a semicircle around the back. As he writes, at least one ascends to the altar. 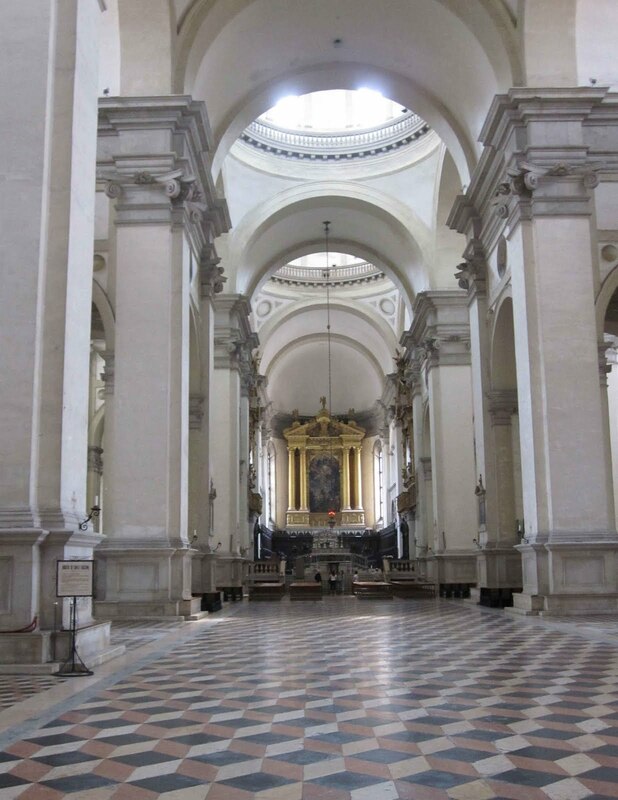 During my wanderings in Northern Italy during the last couple of weeks, I discovered two examples of old cathedrals being organized originally so that the celebrant faces down the church, across the altar in the style we have come to know and……well…. We know St Peter's (and other churches) in Rome was of this type, but here are two others outside Rome. In Verona, the Cathedral is oriented NE/SW. The old high altar faces SW, towards the nave and congregation, and is clearly originally intended to do just that, even though a screen (you can see the pillars) intervenes. The bishop's throne is at the centre of the apse behind. Verona Cathedral, looking SW, down the church towards the nave. 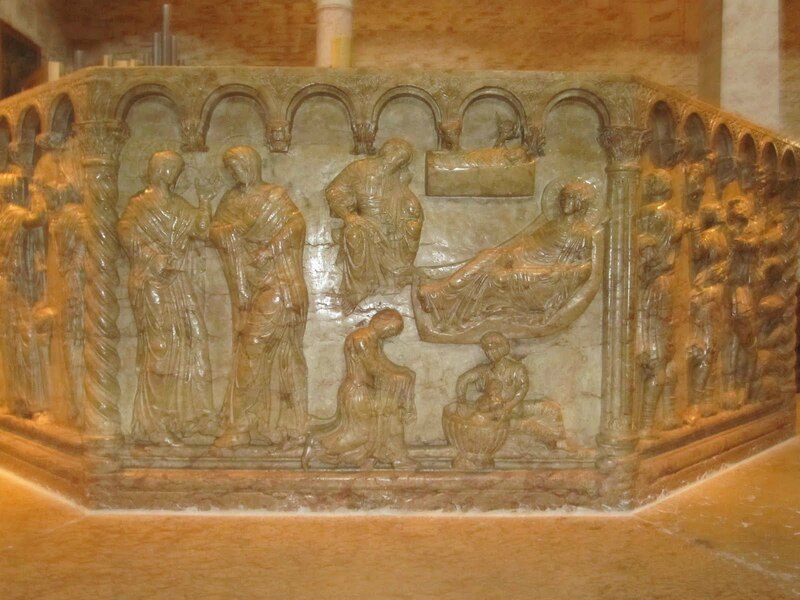 At some later stage, wooden steps have been added on the congregational side, so that Mass may be celebrated NE, into the apse. 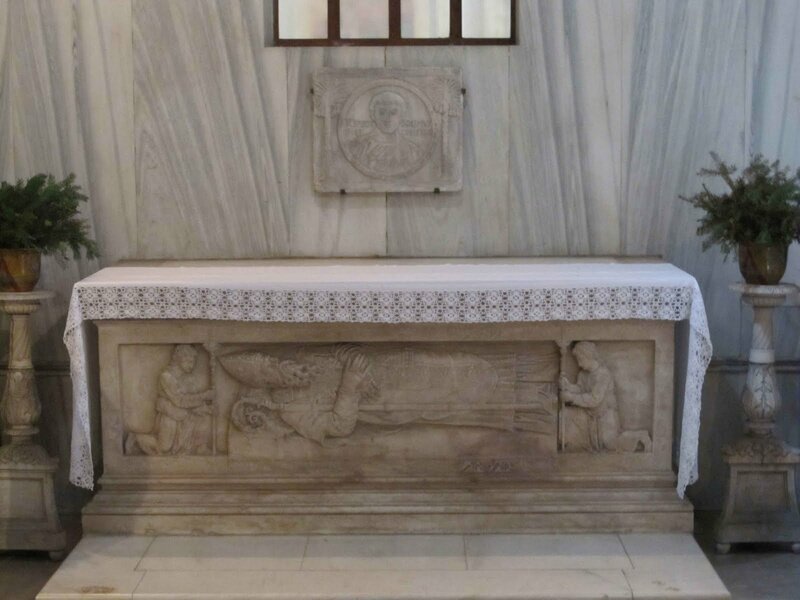 You may note, by way of interest, the 'confession' hole at the front of the altar in imitation of the high altar at St Peter's in Rome. Verona Cathedral, looking into the apse from the rood screen. 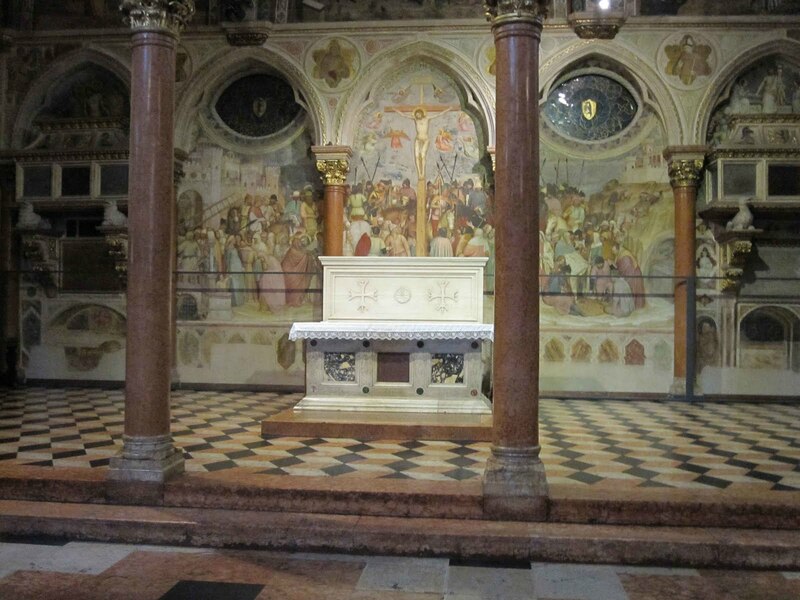 Here is another example in the (former) Cathedral at Chioggia, just outside Venice. 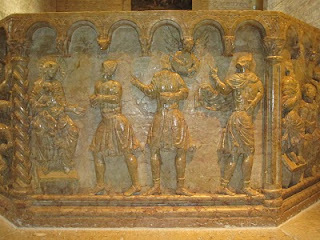 In this case there has been no attempt to add steps in front, but this altar is clearly old and intended to be used just as it is used today, though in this case the celebrant does indeed face East. 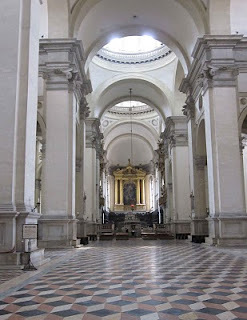 Chioggia Cathedral. looking west into the apse. A couple of years ago, I had as a guest in my house a very splendid young man called John R. He was the grandson of Amish grandparents; his own father had been released from the Amish community for what they call rumspringa; this is a period some (not all) Amish families think important, when their teenage children can experience the world they are rejecting and so choose baptism freely for themselves. Not all return, but those who do find their commitment to the Amish way reinforced. John's father had found the freedom while on rumspringa intoxicating, and had eventually rejected Christianity, eventually finding his way into some Hindu sect. He had met a lukewarm Catholic lass who had shared his various experiments with some enthusiasm, and they had several children together. 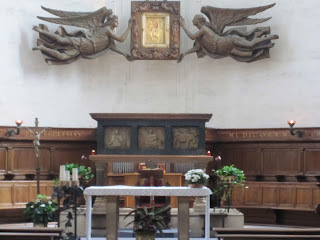 Now they have separated, and the Catholic woman has returned wholeheartedly to her Catholic roots, the younger children following her enthusiastically. John and his fellow older siblings are left confused as to the value of any religion. He spent some time living with his Amish grandparents, and loved and appreciated them. He spent some time at a Catholic University in the Southern United States, and loved and appreciated that. He is a loving and appreciative young man. But now he is rootless, unable to commit to anything. I watched a programme on Channel 4 last night (watch it here) about five young Amish people ('The World's Squarest Teenagers') on rumspringa. They have been brought to England to be thrown among the people most likely (in Channel 4s opinion) to shake their deep faith. It is The Monastery all over again. But it is so wonderful to see such beautiful people, especially the two young women. Virtuous, good women, even beautiful when expressing views that I wouldn't go along with; it is very true, as one of the young Amish men said, that true beauty does not not lie on the outside, but inside. I know that these people (Channel 4) are going to do their best to corrupt the beautiful. But in the first programme, it must have been clear to the meanest mind the superiority of the Amish both in terms of goodness, but also happiness. It seemed apparent even to the charming families that they were put among. Mennonite Protestantism does not appeal to me in the least. But these young people are a very persuasive argument for the virtuous life. I took both pictures; you can considerably enlarge them if you click on them. Ravenna today is an unprepossessing town on the Adriatic coast of Northern Italy, but for a time it was the capital of the Western Roman Empire: the emperor Diocletian had decided no longer to subject himself to the unpredictable whims of the Roman mobs, and had established four capitals throughout the Empire; Italy was governed then from Milan. After a passage of time Ravenna, the little coastal town that had been founded, like Venice, on stilts in a lagoon, succeeded it and became the capital of what remained of the West. It had a port, founded by Augustus, called Classe, and so was handy for Byzantium and for getting troops in and out in a hurry. 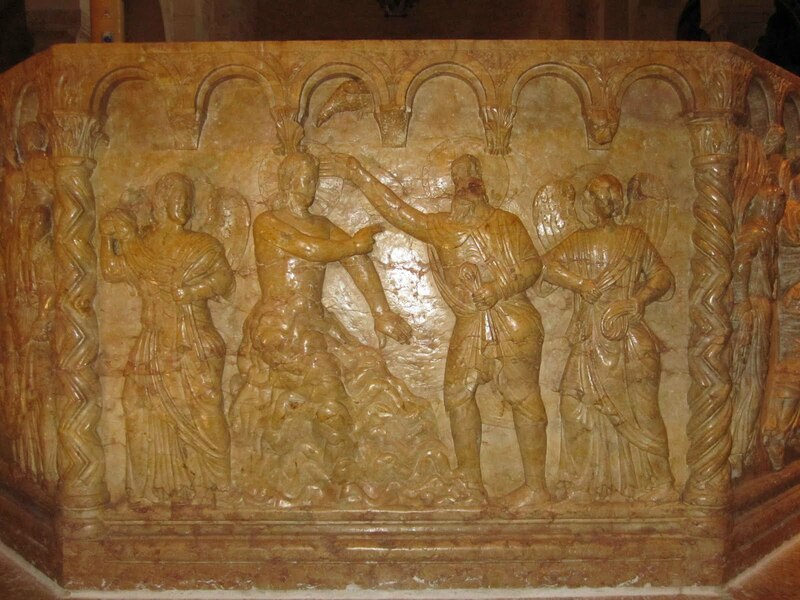 In later eras it became the Ostrogothic capital, and then the location of the Byzantine Exarchate. The Lombards had it until the Franks saw to them, and then Ravenna began its slow decline. Its (presumably magnificent) civil buildings have all vanished now, but its most important religious structures survive, together with many of the mosaics that adorn them, in many cases as fresh and new as the day they were created. 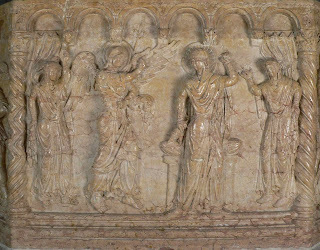 The style clearly recalls to our minds the East, but in fact it is thought that they are some of the few survivors of Western mosaic art and iconography. That there should be similarities is not surprising, given that West and East were part of one world for so long. 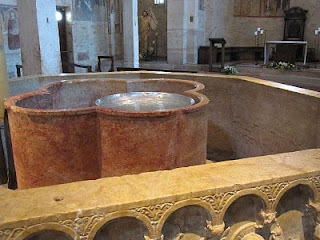 The two examples I am posting today are the central motif in the domes of each of the two baptisteries in Ravenna, the first is is from the 'Arian' baptistery (the Goths were Arians for a long time), about 500, and the other is from the 'Neonian' (otherwise known as the Catholic or Orthodox) baptistery, built around 430. Both show the same scene; our Lord's baptism. But I noticed subtle differences, and if I knew more about Arianism, I might be able to account for more than I can. Ideas, anyone? 1) The Catholic baptistery shows Christ bearded, the later Arian shows him beardless. 2) In the Arian mosaic, the Baptist simply lays his hand on our Lord's head while the Holy Spirit fountains the water. 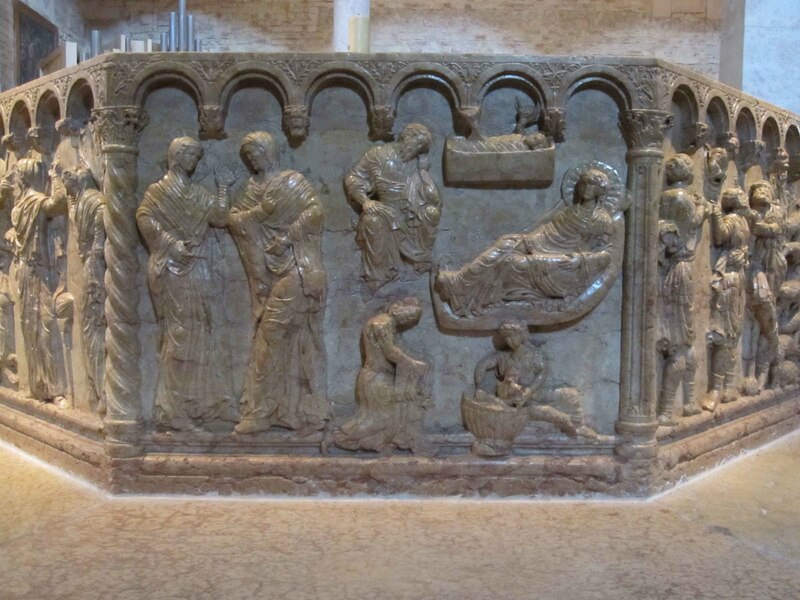 In the Catholic baptistery, John is really doing the baptizing. 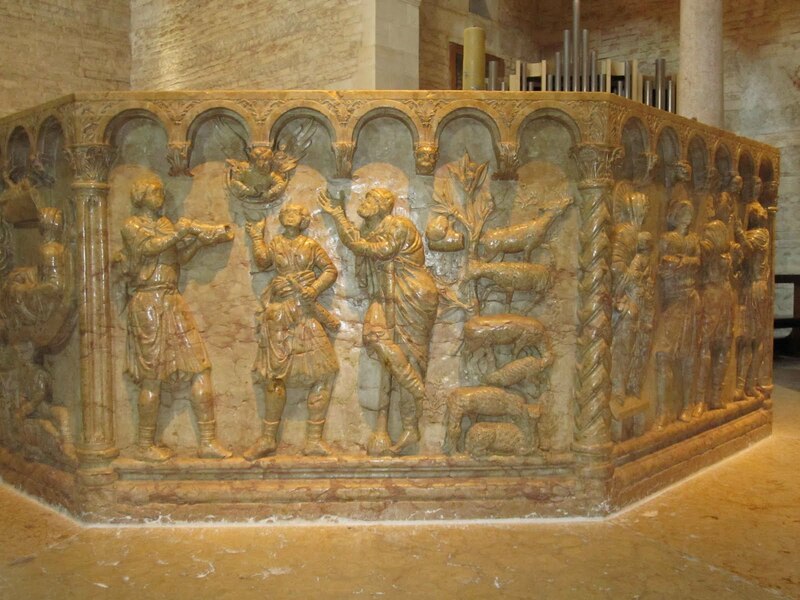 3) Both also show a personification of the Jordan river; however, in the Arian baptistery, there seem to be horns on his head. Is this a reference to Moses (giving water from the rock who was Christ?). 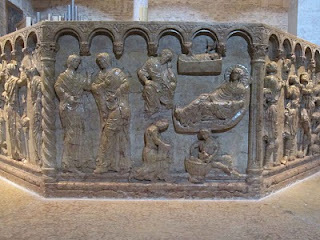 Elsewhere in the baptistery there is a depiction of what looks like an enthroned rock. 1) I think we should also notice that in both cases the baptism is not by full immersion, as the common opinion would have us believe was the universal practice of the Church in the first centuries. It is clearly by affusion, pouring, as we do now in the West, the only difference being that the baptizatus is here standing in water. So let us have no more nonsense about full immersion being the 'proper' way to baptize. 2) In both cases, John is not standing in the water, but clearly outside the font/river. Only the candidate gets into the water. I have known several full-immersion fonts where the celebrant is required to get wet with the candidate. 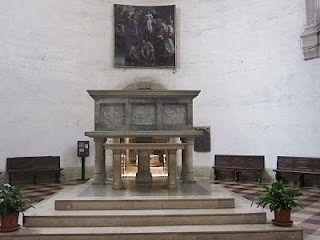 I found this altar on Wednesday, in the church of St Apollinare Nuova in Ravenna (a town I have long wanted to visit; finally I have got there). It lives in a side chapel dedicated to the fallen of World War 1. There is scarcely room for a corporal in the central well, and those 'missal stands' (at least the Gospel side one) must require the priest to crane his neck painfully. Those plaques on the back really are altar cards, though scarcely legible. I wonder whether anyone ever did succeed in celebrating Mass here. It reminds me of my own church in Shoreham: an architect or artist with only an idea of his own artistry and conception, and never a thought as to function or, more importantly, to tradition, or even the 'hermeneutic of continuity'. He saw something that he could pontificate about in stone, and did it. His own idea, his dream, his vision, was supreme; nothing and nobody else was important, not even those who would pay for and/or have to use the creation. The romantic movement has a lot to answer for! Jane of the French Oasis has tagged me for a meme. I'm not a great meme fan, and so won't tag anyone else, but I feel I owe Jane a courtesy because from all accounts she's such a nice person, and also Mac (the meme's originator) for recommending me a very good camera. I am forbidden to include sacramental or (presumably official) liturgical prayers. This is regrettable, because beyond any doubt, the mainstay of my life is the Mass and the Office. I should have cited the traditional versions of both, with the Roman Canon and the Te Deum as my favourite elements of each. 2) The prayer of St Richard of Chichester. (I know there are variants on this: this is the one I like). 3) A prayer that I found once, trawling around, and put in a book that I edited. It comes from the Vernon Manuscript. When thou sufferedst death for me. So take it away from me. Amen. Both 2 & 3 I often say as a thanksgiving after Communion. I like them because they say more about God than about my own demands. I'm far away, right now, sitting in a hotel room in Vicenza, northern Italy. Posting is difficult, so I haven't tried for some days. But I have been following some of the news from the General Synod of the Church of England, and I must profess myself deeply shocked at the way that Anglo Catholics have been treated there. I feel it behoves me to make some comment. While one accepts that the matters under discussion run deep, there is need for charity at the very least on the part of the victors. I perceive none at all; in fact the losers seem to be treated as people who are not entitled to even their civil rights (their very pension is under threat). Where in all this is the evidence of the work of the Holy Spirit and his gifts and fruits? Love, joy, peace and the rest? 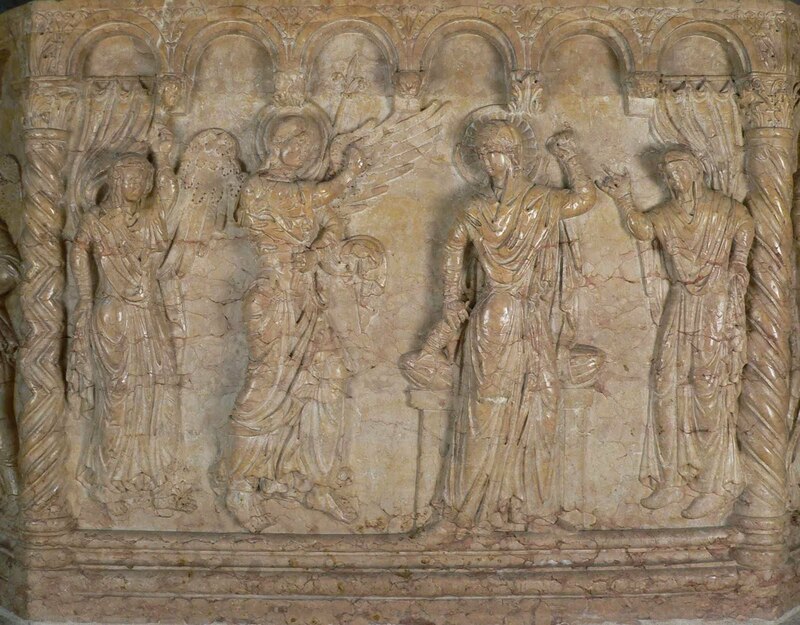 Some of my ecumenical colleagues back home are women, and they are fine Christians and good pastoresses (pastrices?). Where have these dreadful people sprung from? When last I heard, the hunger for power and the crushing of the vanquished was not among the qualities our Lord required in his ministers. How does the coffee smell, Ma? Cynics might suggest that young people, armed with the tools of enquiry acquired through liberal education curricula, have used them to dismantle their own faith. What is apparent is that many young people leave the practice of religion behind when they leave the parental nest. A combination of poor liturgies, uninspiring religious formation and the lure of new experiences, especially sexual ones, don’t encourage Mass attendance. We've been saying this for years and years: welcome to the real world! Several years ago now, Bob Geldof made two programmes on Channel 4, Geldof on Marriage and Geldof on Fathers. The latter is easily found on YouTube, but I can't find the former anywhere. I remember it as being very impressive as coming from someone who doesn't share our faith. Does anyone know where I might find it? And here, thanks to a commenter on his post, is the anthem that preceded it (1857-1949). It sounds a bit like a Sullivan overture, but I sneakingly prefer it, I think. Chant Cafe looks to me to be quite splendid, and I'm pleased to recommend it to you. Stuart McCullough alerted me to his new blog, Ecumenical Diablog. Go and say hello.